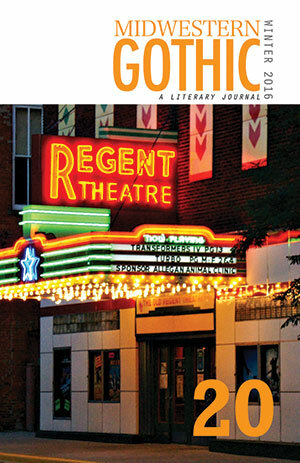 Midwestern Gothic – A Literary Journal » Blog Archive » Issue 20 (Winter 2016) is here! Issue 20 (Winter 2016) is here! We’re excited to announce that Issue 20 (Winter 2016) of Midwestern Gothic has arrived! This issue features the 2nd Annual Lake Prize fiction and poetry finalists, in addition to work that explores urban and rural, fractured settings, and nostalgic memories from exciting voices in the region. Issue 20 features fiction from: K Brattin, Drew Coles, R.M. Cooper, RS Deeren, Marnie Bullock Dresser, Brad Felver, Erin Fortenberry, Jeannette Hinkle, Joseph Johnston, Kevin McIntosh, Hadley Moore, Caitlin Palmer, Mike Salisbury, Timothy Scott, and Chloe Seim. Plus poetry from: Kenzie Allen, Erin Bealmear, Bethany Bowman, Chloe N. Clark, Brian Clifton, Katie Hartsock, Lisa Higgs, Adam Hughes, Mark Madigan, Sandra Marchetti, Jay Newman, Terry Savoie, Marc J. Sheehan, Z.G. Tomaszewski, and Jessica L. Walsh. Read about all of the 2015 Lake Prize Fiction finalists. Read about all of the 2015 Lake Prize Poetry finalists.